At Northwestern Mutual, we’ve been helping clients take control of their financial future for nearly 160 years. Through the Civil War, the Great Depression, two world wars and a number of recessions, we’ve stood alongside our clients, helping them manage financial risk and achieve financial security. With every important decision, we ask ourselves this poignant question: “Is this in the best long-term interest of our clients?” It’s the primary reason we created a distinctive, comprehensive planning process that puts your needs first. Our business is about helping people succeed, and that starts with putting people first – our clients, employees and financial professionals. We’re passionate about helping people build brighter futures and believe the best way to do that is by building strong, long-term relationships; finding out what matters most to people; and providing the financial guidance, tools and solutions they need to succeed. We’re known for our financial strength and have the highest financial strength ratings awarded to any life insurer by all four of the major rating agencies. More than just bragging rights, it means that we’ll be here for the more than 4.2 million clients who are counting on us to help them build a secure future. We not only reserve the capital needed to honor our commitments and survive economic downturns; we also grow our surplus so we can seize opportunities, invest in our people and fund initiatives that will better serve our clients. We take a long-term view. As a mutual company, providing the best long-term value for our clients is something else we value. We don’t believe in chasing fads or taking undue risk for short-term gains, so we make every decision with an eye toward the future. It’s how we run our business, design our products and manage our investment portfolio. And it’s an important part of why we’re able to help our clients build a lifetime of financial security. Identify your goals. Our advisors make sure they understand what’s important to you and your loved ones, where you are today and where you want to be in the future. Develop your personalized plan. They then analyze your financial situation and develop recommendations that can help you and your family achieve financial security. Implement your strategies. They’ll bring your financial plan to life with proven financial products and quality solutions. Review your plan. Even small changes in your life can impact your financial plan. Our advisors will help you adjust your plan as needed to stay on track. © 2019 Northwestern Mutual Wealth Management Company, Milwaukee, WI. All rights reserved. 720 E Wisconsin Ave Milwaukee WI, 53202 - (414) 271-1444. 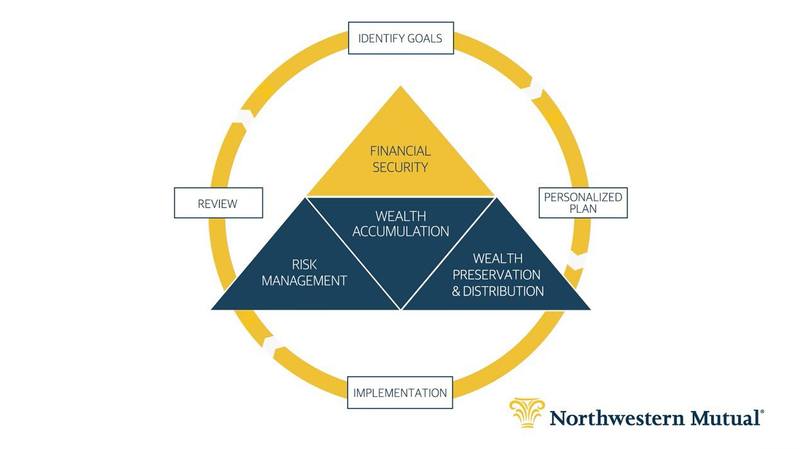 Depending on the products and/or services being recommended or considered, refer to the appropriate disclosure brochure for important information on the Northwestern Mutual Wealth Management Company, its services, fees and conflicts of interest before investing. To obtain a copy of one or more of these brochures, contact your representative. Andrew Lich uses Infinity Wealth Advisors as a marketing name for doing business as representatives of Northwestern Mutual. Infinity Wealth Advisors is not a registered investment adviser, broker-dealer, insurance agency or federal savings bank. Northwestern Mutual is the marketing name for The Northwestern Mutual Life Insurance Company, Milwaukee, WI (NM) (life and disability insurance, annuities, and life insurance with long-term care benefits) and its subsidiaries. Andrew Lich is a Representative of Northwestern Mutual Wealth Management Company® (NMWMC), Milwaukee, WI (fiduciary and fee-based financial planning services), a subsidiary of NM and federal savings bank. All NMWMC products and services are offered only by properly credentialed Representatives who operate from agency offices of NMWMC. Representative is an Insurance Agent of NM and Northwestern Long Term Care Insurance Company, Milwaukee, WI, (long-term care insurance) a subsidiary of NM, and a Registered Representative of Northwestern Mutual Investment Services, LLC (NMIS) (securities), a subsidiary of NM, broker-dealer, registered investment adviser and member FINRA (www.finra.org) and SIPC (www.sipc.org). The products and services referenced are offered and sold only by appropriately appointed and licensed entities and Financial Representatives. Financial Representatives and their staff might not represent all entities shown or provide all the services discussed on this Web site. Not all products and services are available in all states. Andrew Lich is primarily licensed in Missouri and may be licensed in other states. Certified Financial Planner Board of Standards Inc. owns the certification marks CFP®, CERTIFIED FINANCIAL PLANNER™ CFP® (with plaque design) and CFP® (with flame design) in the U.S., which it awards to individuals who successfully complete CFP Board's initial and ongoing certification requirements. The Chartered Advisor for Senior Living (CASL®) designation is conferred by The American College of Financial Services.